We will hopefully be presenting here on our experience in West Carleton! Health Promotion Ontario provides a forum for students, practitioners and researchers to come together and discuss issues and ideas in and around the field of health promotion. This year’s conference will be in celebration of the 30th anniversary of the Ottawa Charter for Health Promotion on October 18-19, 2016 in Ottawa, Ontario. To focus on discussing where the profession should head in the next 30 years, we will focus on the theme of what it means to be “Pushing Boundaries” in our practice. We will be exploring the importance of political, sectoral, disciplinary, methodological, institutional, and personal actions. What are the consequences of being risk averse? Accordingly, we are inviting presenters from various fields with diverse perspectives, to present work that enacts the strategies and actions of the Ottawa Charter and helps us to look to the future. This is not a press release, but it’s close. Today, we were the official recipients of and $183,000 grant from the New Horizons for Seniors Program of the Federal department HRSDC. This is not news to us, of course, but rather for the community – we had to keep it under wraps until an official announcement was made, and our Member of Parliament from Kanata Carleton did just that for us this morning. I wish I had recorded her speech. It was uplifting and overwhelmingly supportive of the work we are doing with the community in West Carleton. Thank you Karen. Read on for my wordy contribution to the event. There were also cookies, for those of you that missed it. “This grant is one piece of an Ottawa wide collaborative initiative aimed at developing projects to reduce isolation in our most vulnerable population – rural seniors. The research is compelling – isolation and lonliness is barrier to optimal health – it can shortens ones lifespan. This is a project that while distinct from the work ongoing in West Carleton, it is inextricably related and will be an integral piece of the enabling solution going forward. The purpose of this new program is to build on recent research that we completed here at Western on the merit, sustainability and value of befriending, or friendly visiting programs, the results of which were surprising and have led us to lend some serious consideration to the way in which we can build community capacity to reduce isolation experienced by seniors and caregivers in rural Ottawa. It is our hope that the project will also present an economic development opportunity – but this is very much early days with respect to how this may play out. I can tell you that the funds we have received will be used to develop and support outreach and training for the role of Community Helper – those residents from West Carleton, at least initially, who will with support be pivotal in helping to reduce rural isolation of seniors and successful aging in place. The initial 2 years of this project will live at Western Ottawa Community Resource Centre, and West Carleton. In the third and final year, we will be working with our rural counterparts in the rural south and east ends of the city – the Eastern Ottawa CRC, Rural Ottawa South Support Services and the Nepean Rideau Osgoode Community Resource Centre – to support implementation of this model. We will evaluate this project and ensure that it becomes a sustainable model through work directly with the community. We know that be continuing to build one the work we’ve undertaken – the co-production, the engagement, and by working with our volunteers, partners and champions – many of whom were in the audience today – the entire community will benefit. I guess it’s a news day! I had the pleasure of listening to Gary Machan today. He’s a “fellow learner” from the Ontario Association of Health Centres (and the guy that recently shared a report from the Southeast LHIN that showed that raising income of those in poverty alone isn’t enough to reduce mortality if isolation isn’t reduced – what? But also…obviously). His talk focused on the concept of mattering, of the importance of feeling as if one belongs, and the importance and weight of community vitality in the work we do. It dawned on me during his presentation that mine on May 7 has to be similar in scope; it’s my job to collapse the tangible outcome oriented purpose of this engagement work (locally accessible and affordable programs & services) with the work of building community vitality, enhancing belonging, and meaning for residents. With this project, we’ve dug deep. And we’ve done it with a lot of help from the residents in the community, and their help will continue to be the cornerstone of whatever is successful in West Carleton – this is a call for residents to support next steps as part of a steering committee – yes, I’m speaking to you! If we were looking for priorities, we have certainly narrowed down to several key issues and the next steps include ACTION. Ultimately though, I’ve come to the conclusion that it makes no sense to focus singularly on the provision of high quality health care if equal weight is not allocated to developing and nurturing social supports – those that meet basic needs, education needs, and provide emotional supports and enhance social integration – makes sense, right? Each and every person who participated in person and by proxy, those who couldn’t make it and those who felt they didn’t belong, as well as those who didn’t know about the project all matter. Their voices are being heard and integrated into every conversation we have on these issues – in this blog, around tables of service providers and among volunteer groups and beyond. Often times – and I feel that I can report on this because it’s true) there is a pervasive sense in rural communities that they don’t matter. Seniors and caregivers and isolated persons don’t feel as if they matter, either. I’m here to tell you that the perspectives, the stories and the experiences of aging that we heard in this rural community matters to us – in fact, this engagement process would have gone nowhere and would have been far less rich without them. This process, I have realized, is as much about access, opportunity, partnerships with unusual suspects and outcomes as it is a story of bringing people back into a space where their stories matter. It may be a little early, but since I’ve been telling OUR side of the story alone, I’d like to offer a platform for people out there to do the same. I *think* it’s possible to leave comments on my blog, but being new to blogging, it may be not be. That said, I’m inviting you to do so anyway. It can’t hurt to try. While I owe this blog a recounting of the events of April 4 and 16th, I am happy and have just enough time to provide a high level overview of some of our successes. Dr. Bruce and I (bounded by a tonne of support from my colleagues from WOCRC) have been in contact with over 250 seniors and caregivers since March 2 in Fitzroy Harbour, and another 85 by proxy. We’ve hosted 4 formal forums and multiple smaller group meetings to determine what the priorities for seniors and caregiver may be in West Carleton. A number of wonderful things have happened. 1) Themes have emerged, and they likely wouldn’t surprise anyone but there have been surprises, for us. You see, working in the community, health and social services sector, you come to believe that what is done through programming is the right thing…it’s what everyone seems to want, or it’s what appears to be working, or our funders are happy. An example would be the oft mentioned ADP (Adult Day Program) on-site at the Western Ottawa CRC Kanata office (where clients with dementia are dropped off for the day and are provided with a stimulating environment and caregivers are provided a measure of time off – AKA repite). It’s a program that runs from 9 – 4 pm, Monday to Saturday, is always full and participants pretty much unanimously indicate satisfaction with the service. 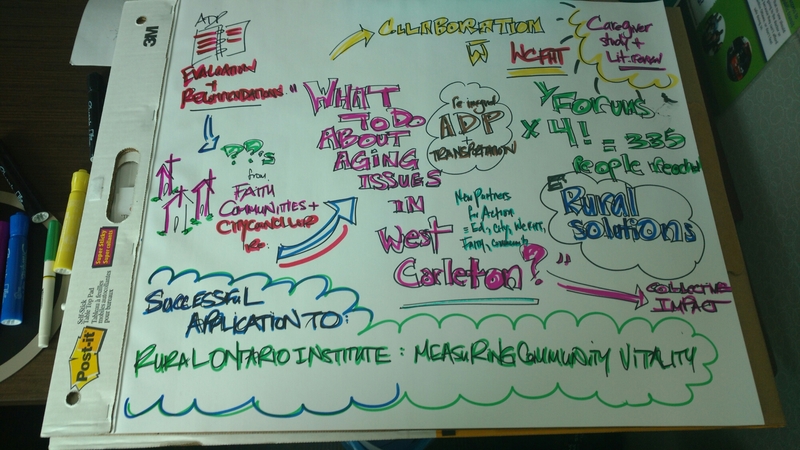 Now, the ADP evaluation that kicked off our work in West Carleton was strongly indicative that alterations could be made that would make the program better, but mostly only because continuous quality improvement is seen as a good thing. Ultimately though, that evaluation, as comprehensive as it was, made recommendations that would be challenging to implement in any new program devised for West Carleton, and likely would not prove successful in the same way. So guess what? If we ever thought a traditional ADP would be the program that comes out of all of this work, I believe we were mistaken. You have my promise that if ADP it is, fine. But…it won’t look a thing like it does in Kanata. These, my friends, are the results of deep listening to community and the act of co-imagining what could be. Oh, and the ADP example is only one. The picture of what is needed to support this population is coming together nicely. What can community members do best for themselves and each other? What can community members do best if they receive some support from organizations? What can organizations do best for communities that people can’t do for themselves? With a view to answering, Dr. Barry Bruce and I are busy designing a process that we hope will result in dynamic solution focused dialogue on May 7. We absolutely cannot wait to start phase 2 of this project, and it begins with you. What’s the most significant change in the past few months as a result of this community project? Again, your answers are welcome publicly or privately and I will respect your privacy if done so via email, but they are important – so please consider being a contributor. Many thanks for this amazing experience, and see you on May 7! As active, engaged and interested community members, you are invited to add your voice and suggest local solutions. Our objective for the day is to people through “solution spaces” on each priority, so that we can plan action to address them together. Please feel free to contact me if you have any further questions about your involvement or to let us know if you can make it.